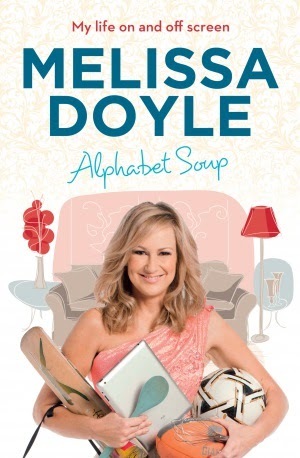 A memoir of short snippets of the life of Melissa Doyle, Alphabet Soup presents to its reader the more personal life of the woman who has touched our hearts through our television for many years. Alphabet Soup fell onto my desk unannounced at a time when I had a lot to read but with a well known figure on the front cover I was intrigued. I will be honest and say my first thoughts were that of ‘not another book written by a celebrity journalist’. Those who know me and my book preferences will know that books written by journalists are usually steered clear of as I find them to be dry and lifeless. This was not the case when it came to Alphabet Soup by Melissa Doyle. Melissa Doyle writes with wit, a mothers touch and a sense of expression. I had a giggle and I related. As a working mum Melissa made me feel normal and had me realising that I was not the only woman that felt she needed to possess super human powers to achieve the life she desired. Alphabet Soup shows the ‘human’ side of Melissa Doyle. Love her or hate her you soon realise she is just like every other woman who is trying to balance a career and family life. At times I did feel some of the memoirs within Alphabet Soup were a little short, wondering what the point or message was, but each was amusing and fulfilling in it’s own right. At no time did I feel Melissa was bragging, gossiping or big noting herself. She writes as the girl next door who has been waking at 3am for many years to bring the happenings around Australia to our television screens. I do wonder how her kids will feel when they hit young adulthood and realise that the things they did as kids has been recorded for the world to read for years to come. Alphabet Soup is a quick read for the busy woman. Suited as a weekend read or to be read as a memoir a night upon retiring, it is lighthearted and inviting. Alphabet Soup could be said to be a bit like a series of blogs within a book written by a mother that is there to help other mothers feel good about themselves. It is a nice book written by a lovely lady with a heart of gold and a smile that lights up a room. The world needs all the niceness and kindness it can get but I can’t help feeling Melissa Doyle played it a little too nice and safe at times, leaving Alphabet Soup lacking that little something that gives it the pizazz I would have liked to have seen. To me it was just a read. Without her celebrity status the weight of the book would be light and airy and probably be something I would not have continue to read or would have read over many weeks whilst reading something else at the same time. Overall Alphabet Soup by Melissa Doyle is worth a read if you are a fan of Melissa’s or a working woman who wants to feel as though she is not alone. If you are looking for a book that lacks a lot of deep thought and concentration for a lazy weekend read then Alphabet Soup may suit your needs.